The following is a statement by John Doherty, Commissioner of the New York City Department of Sanitation, about the department’s response to Hurricane Sandy. 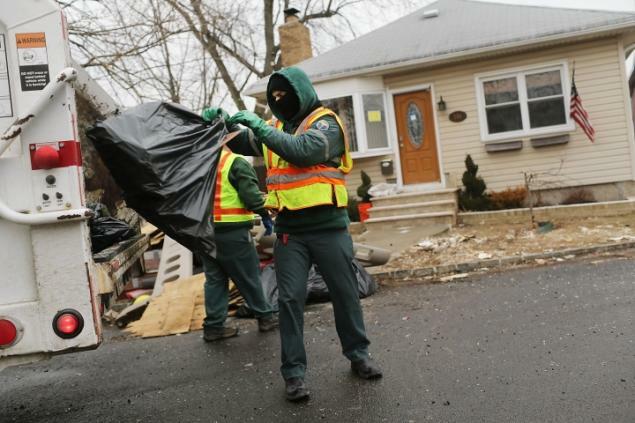 Sanitation workers remove debris from a flood-damaged Staten Island home. Now, some Sanitmen are contesting their post-hurricane cleanup pay. Photo by Spencer Platt. February 26, 2013. Good afternoon Chair James, Chair Arroyo, Chair Gennaro, Chair Mark-Viverito, and members of the City Council Committees on Sanitation and Solid Waste Management, Health, Environmental Protection and Parks and Recreation. I am John Doherty, Commissioner for the New York City Department ofSanitation. With me today is Bernard Sullivan, First Deputy Commissioner for Operations. Thank you for this opportunity today to explain the Department’s response to Hurricane Sandy, the most devastating storm to hit the City in recent history. As Sanitation Commissioner and a City resident, I am very proud of the hard work and dedication that the men and women of the Department showed during this trying time. Many of these men and women are from the City’s hardest-hit communities and lost everything due to Hurricane Sandy, but they still managed to report for duty to their assigned work locations, working twelve hour shifts seven days a week and providing an unprecedented level of service and compassion to their fellow New Yorkers and, in many cases, their own neighbors. The response to Hurricane Sandy by the men and women of the Department was immediate. On the morning after the storm, the Department was fully mobilized and was clearing the streets in all five boroughs of all storm-related debris to ensure safe passage for emergency vehicles. The Department also coordinated with the Department of Parks for the removal of wood debris to open the flow of traffic on streets that were impeded by fallen trees and branches from the storm. Department employees worked tirelessly 24 hours a day, seven (7) days a week, with Sanitation workers assigned to twelve-hour shifts that lasted from the end of Hurricane Sandy through the beginning of December, in the City’s impacted communities to ensure that all storm-related debris was picked up expeditiously. It was important for the Department to ensure that the residents of these areas, reeling from the devastating impact of the storm, felt some comfort in knowing that the seemingly endless debris placed out at the curb would be removed quickly to create a safe and clean environment, which would aide them in the process of moving on and rebuilding their lives. During this massive Clean-up, the Department utilized collection trucks, front end loaders and dump trucks to facilitate the removal of storm debris. In addition, Department equipment from other districts was temporarily re-assigned to the impacted areas to expedite the removal of the storm debris. The Department also coordinated with the Department of Transportation and several branches of the military for assistance with debris removal. Extra collection service was provided to NYCHA sites that had their containerized systems damaged, and the Department also provided collection service to special needs sites that were distributing important supplies and operating as feeding centers. The Department also assisted the Parks Department by removing over 2,700 loads of sand which we also helped return to the City’s beaches after the sand was properly sifted. Additionally, public use containers were placed out by the Department in the impacted areas to allow residents in those areas to discard storm-damaged materials. At the height of the storm Clean-up, the Department placed out over 100 containers, with roughly 30 containers remaining on site today. The enormity of the amount of debris, coupled with the City’s desire to remove such debris as quickly as possible, led the City to open seven (7) temporary debris storage and reduction sites for non-wood storm debris. These storage sites were selected from a presurveyed list compiled in 2006 by a multi-agency team comprised ofthe Department, the Office ofEmergency Management, Parks, the Economic Development Corporation and the New York State Department ofEnvironmental Conservation (DEC). These sites were located at Riis Park,, Beach 52nd Street, Wolfe’s Pond Park, Cedar Grove Park, Fresh Kills Plant 1, Fresh Kills Plant 2 and Father Capodanno Boulevard. Five (5) ofthese sites were Cleared and Closed by November 19th. All subsequent loads of storm debris were delivered to the temporary sites at Riis Park and Father Capodanno Boulevard. The DEC issued a general permit for operating these temporary sites. The sites were staffed and managed by the Department up until November 9th at which point the sites were taken over by a contractor for the United States Army Corp of Engineers. 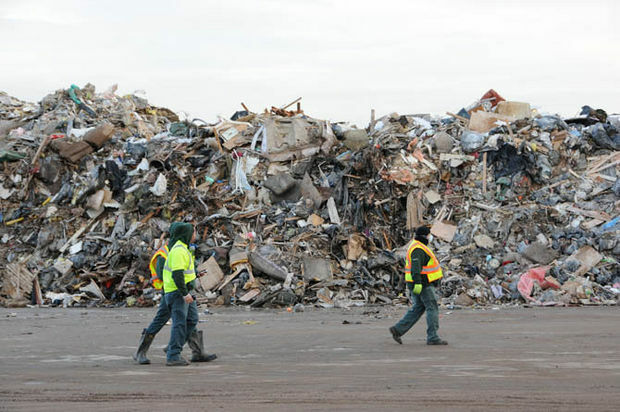 Currently only Riis Park (which accepts loads from affected areas in Brooklyn and Queens) and Father Capodanno Boulevard (which accepts loads from affected areas in Staten Island) continue to operate as temporary storage sites..Debris that is delivered to these two sites during the day is generally shipped out that night. Currently these sites are still needed for storm debris collection operations. In addition to establishing the temporary waste sites, the City entered into special contracts for the debris Clean-up and disposal. More specifically, the Department entered into two (2) emergency contracts for transfer station capacity of construction & demolition (C&D) material. The Department also utilized an existing contract with a C & D transfer station operator for C & D disposal capacity. These contracts were used to deliver storm debris directly from street operations as well as from temporary debris storage sites. The Department also entered into three (3) emergency contracts with operators of putrescible waste transfer stations. These contracts were necessary due to the impact of the storm on our export network, including rail disruptions, transfer trailers having difficulty getting fuel, and the temporary loss of the Covanta waste-to-energy plant which serves Sanitation Districts in Manhattan. The Department also contracted for piling and hauling equipment/operators through the use of an emergency contract. This equipment was used for piling and hauling debris from the affected areas as well as piling and hauling at the temporary debris storage and reduction sites. As of February 24th, the Department has collected over 420,000 tons of Hurricane Sandy storm debris and over 27,000 tons of woody debris throughout the City. Residents in all areas impacted by Hurricane Sandy were instructed by the Department to place out all materials at the curb for ongoing collection. The Department also deployed personnel specifically to remove CFCs from discarded refrigerators and air conditioners in these storm-hit areas. To date, the Department has removed CFCs from over 3,700 refrigerators, air conditioners and other CFC containing appliances prior to their collection, and collected 1,178 tons of metal that was recycled, all of which was generated in the storm-hit areas. These numbers are in addition to the Department’s regular refuse and recycling tonnage collected, and CFCs removed from the rest of the City. The Department resumed curbside recycling citywide on November 11th after a short interruption of service due to there-assignment of personnel in response to the storm clean-up. Additional collections in the impacted areas remain ongoing and will continue until March 18th. The Department continues to remove non-commercial waste from homeowners engaged in small restoration and repair projects. However, homeowners who are undertaking large demolition and reconstruction projects must arrange for their own dumpster by contacting a private rubbish removal service. Because bulk and construction debris generated by hired contractors or fee-for-service personnel on home repair or renovation projects is considered commercial waste, it is the responsibility of the contractor to arrange for appropriate private disposal. As of February 19th, the Department has submitted documentation for costs totaling $95 million to FEMA. The total cost of the Department’s Hurricane Sandy clean-up response is not yet available since our clean-up has not yet officially ended. We will be happy to answer your questions after all of my colleagues have concluded their testimony. Related post: “Sanitation Workers: Hurricane Sandy’s First Responders,” 0/30/2013. Photo by Staten Isand Advance/Steve White. January 4, 2013. This entry was posted in Archives, Disaster, Government, Labor, Sanitation, Urban. Bookmark the permalink.